String one 4mm lilac stone bead onto a sterling silver 1-inch eyepin. Form a simple loop on the straight end of the wire, creating a 4mm lilac stone beading link. Repeat to create a total of six 4mm lilac stone beading links. String onto a 2-inch sterling silver headpin: one hole (from the outside in) on one square with circle silver bead frame, one 12mm lilac stone bead, one 4x1mm sterling silver beaded rondelle then the second hole (from the inside out) on the silver frame to create one square with circle silver bead frame with 12mm lilac stone bead drop. Using side-cutting pliers, cut four 8-1/4 inch lengths of sterling silver 3mm round link cable chain. Using two pair of chain-nose pliers, open a 5.5mm jumpring. Pass it through the loop attached to the hook portion of the clasp, the first link of two 8-1/4 inch lengths of silver chain and one end of a 6mm lilac stone beading link. Close the jumpring. Open a 4.5mm jumpring. Pass it through the second loop on the 6mm lilac stone beading link and the first loop of a 6mm green serpentine beading link. Open a 5.5mm jumpring then pass it through the last loop on the last 6mm lilac stone beading link added in Step 5, the first link of two 8-1/4 inch lengths of silver chain and the loop attached to the second half of the clasp. Close the jumpring. On one side of the necklace, open one loop on a 4mm lilac stone beading link then pass it through the 22nd link of one 8-1/4 inch length of sterling silver 3mm round link cable chain. 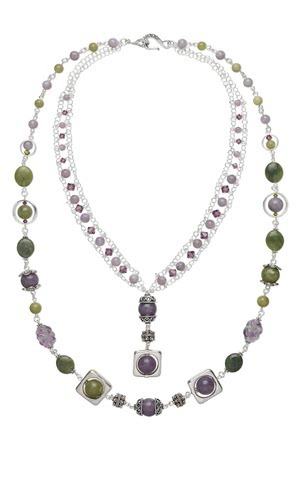 Repeat to attach the second loop of the 4mm lilac stone bead link to the second chain. Open a 3.5mm jumpring then pass it through the last link of both pieces of chain. Close the jumpring. Add a second 3.5mm jumpring to the first. Repeat Steps 7 - 9 to create a mirror image of the first half of the necklace using the two lengths of chain attached to the other half of the clasp. Open the last 3.5mm jumpring at the end of one half of the necklace then pass it through the one loop on a 12mm lilac stone with half-round bead cap beading link. Close the jumpring. Repeat to attach the second set of chains to the beading link. Open the opposite loop on the 12mm lilac stone with half-round bead caps beading link and attach it to a loop on a sterling silver beaded scroll beading link. Open the opposite loop on the sterling silver beaded scroll beading link and attach it to the square with circle silver bead frame with 12mm lilac stone bead drop.